The woman from Italy claims to have been impregnated by aliens several times. Apparently the creatures removed the other fetuses at around 2 months. Giovanna claims that the creatures speak to her telepathically and that they have told her they want to create a hybrid race that is genetically close to their species.Because we are supposedly biologically compatible with their race, we have been chosen. Or more specifically, Giovanna has been chosen to propagate their race by means of a new hybrid species. Giovanna relates that the aliens visited her often when she was a young girl. At that time the aliens would use her for research, collecting biological material (tissue and blood). Their nocturnal visits left marks on her body, along with a phosphorescence material that Giovanna says is something they use as a disinfectant to prevent her from getting infections from them and to prevent them from getting infections from her. When examined by researchers, the phosphorescent substance taken from Giovanna’s room provided evidence that the substance was not natural and that it included no nitrates or phosphor. It was also magnetic. Doctors also found something implanted in Giovanna’s head but could find no scar indicating how the object got inside her head. The object implanted was of undetermined origin and could not be qualified. It's a frog. 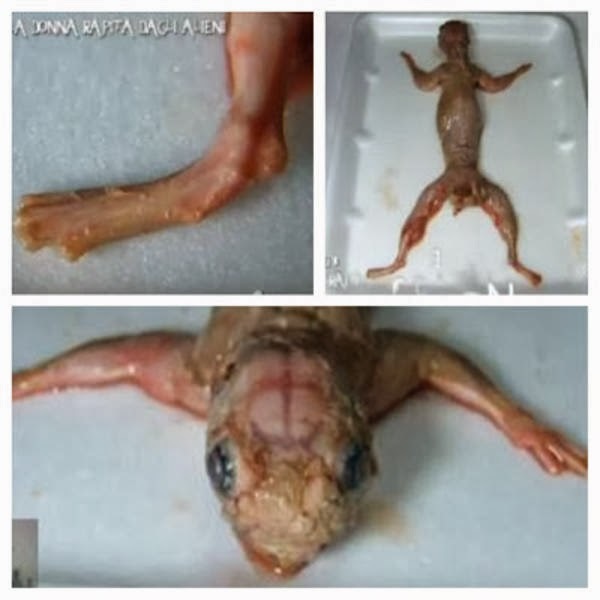 It's a skinned frog. This story is 5 years old btw.